The first two paragraphs of the introduction spoke to me immediately, referencing whining in the house, using our words, and remembering to take deep breaths! Like the author, I know that cracking jokes and having a positive attitude make life better, but I’m often too frazzled to do anything but yell at my kids to stop yelling. I also find it difficult to take advice about meditation unless that advice-giver also has young kids–this author, a clinical social worker with two young kids, knows my struggles and so her writing speaks to me where I am. This book contains ideas and advice that seem approachable and possible! Naumburg writes, “Mindful parenting is about remembering that in any moment we have a choice about how we engage with, and respond to, the details of our lives. And it all starts with a willingness to notice.” Notice–just show up, she tells us, because our children don’t want us to be perfect, they just want us to be there with them. I love how each chapter and concept is paired with examples from her own parenting experiences (there is mention of refusal to put on shoes) and visually broken up into chunks. Sections like “slow down” and “self-care” are short and manageable to read in the small bursts of time I get to digest a book. It seems each time I pick it up and scan to find my place, a new piece of advice speaks to what’s going on with me at that time. My favorite section so far is “Singletask.” I realized the other day that I am never, not for an instant, doing just one thing–because even when I’m sitting still, I’m also lactating for 2 kids. So knowing this, why am I also trying to unload the dishwasher while microwaving my kids’ hot dogs and packing lunches while eating breakfast? Why? Within this section, Naumburg brings up the love-hate relationship she and I have with our smart phones. I’m so guilty of sneaking peeks at various apps while my kids perform medical examinations on me, checking facebook while I’m doing other chores. She has approachable and sensible ideas about this and all types of multi-tasking. 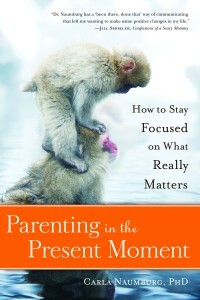 Parenting in the Present Moment has a heavy emphasis on how a meditation practice can change and improve all of our lives. Like many parents, the idea of finding even five minutes to sit privately and meditate seems daunting. I like this book because of the gentle reminders to take things one step at a time, and repeated ideas for ways to make a meditative practice work even amidst the lives of parents home with young kids. She is filled with great ideas, like taking a few mindful breaths before entering our kids’ rooms to wake them for school. I look forward to finishing the book and putting some of her ideas into practice, starting most particularly with Three Mindful Breaths. It will be a much better experience removing socks from the toilet after I’ve taken three deep, healing breaths, right? Have you practiced mindfulness in your parenting or found space for a meditation practice? Leave us a comment to share your experiences!